Calling on new wide format digital graphics prospects almost demands that the printer is able to prove the ability to produce a wide range of applications. The challenge is to approach finding new customers in new and adjacent markets at a strategic level. As a printing organization, you are probably feeling the effects of tighter supply chains, challenging customers and rising costs of supplies. These dynamics push printers to find new ways to add to their top and bottom line by finding new niches and adding new services. At the same time, many printers want to stick to their knitting, the markets and customers they know well. So, as a print service provider, can you "stick to your knitting" and "diversify"? Not only can you, you will have to. 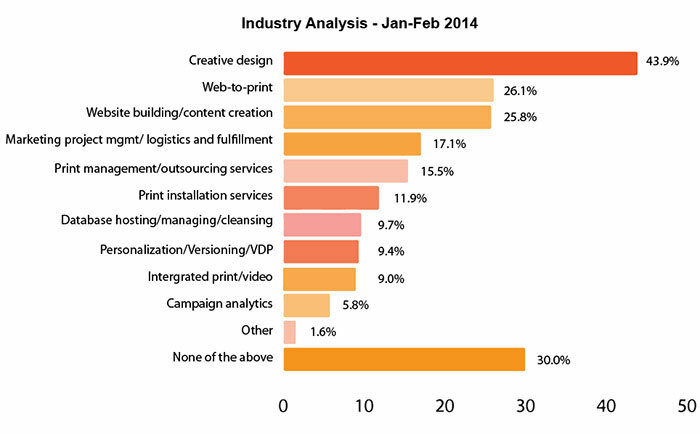 In a recent InfoTrends survey: Wide Format, a Critical Part of the Communications Mix, we asked wide-format digital print service providers what areas they have added to their business to help meet customer demands in the last 12 months. There are a few things about the answers to this question that I think are particularly interesting. First, 30 percent of respondents reported that they have not added anything to their business over the last 12 months. It's possible that this is the case because they are already doing all of these things - great! Otherwise, doing nothing is a very dangerous strategy because, when all around you companies are adding these services and capabilities, your company will fall behind. When everyone else is getting better, if you are not getting better, you are getting worse. I also find it compelling that two of three top areas in which shops seem to be adding services fall on the creative side. Almost 44 percent of the shops indicated they are adding creative design services, while another 26 percent reported adding website building/content creation. Part of this is that, since run lengths are getting shorter and order frequency is up, more capacity is required on the creative and prepress sides. Many of the services being added by print shops are information-technology related, and not necessarily print-related. Services such as database hosting/managing/cleaning and campaign analytics are on the rise because customers increasingly want to know that their promotional budgets are being used effectively. Whereas not long ago these IT-type services would have been the domain of a marketing company or advertising agency, we see more printing companies investing in these services, i.e, diversifying into new services to create new lines of business and new services for which they can charge. 1. Finding new customers in new/adjacent markets; I'm not talking about a print shop owner opening up a taco stand, but about a company that has historically identified itself as a sign shop investing in a T-shirt printing system and marketing itself in the T-shirt and garment printing industry. I believe that many wide-format graphics printers operate like this all the time anyway because one of the strengths of their wide format digital printing equipment is its application flexibility. Calling on new wide format digital graphics prospects almost demands that the printer is able to prove the ability to produce a wide range of applications. The challenge as we go into a new year is to approach finding new customers in new and adjacent markets at a strategic level. One of the areas that InfoTrends is seeing a great deal of interest is the area of digital textile printing for the décor and garment market. Often the production of these graphics utilizes much of the same digital technology used to create conventional graphics. In fact the equipment is often supplied by some of the exact same digital printing equipment suppliers such as HP, Mimaki, EFI and Durst. Other digital wide-format equipment vendors like Roland offer the equipment to get into the ad specialties, novelty printing and even package prototyping. 2. Finding new customers in existing markets, an example of which would be creating an online store to be able to take orders from customers that find you on the Internet without your direct salesforce calling on them. This can be a great way to aggregate small accounts and even consumer business. Really being successful at finding new customers in existing markets as a matter of strategy requires effort from the top down at most printing establishments. One of the exercises that InfoTrends has seen work well for shops that want to find new customers in new markets has been the specific development of a marketing exercise (Figure 2) to identify new customers and prospects. The marketing exercise goes like this: Shops should develop and analyze a current and detailed customer list and a bid/miss list. By segmenting the served accounts by geography, type of industry, what they buy, why they buy from you, and type of buyer they are, primary markets are identified. Recognizing what types of accounts you presently serve should help you develop a list of targeted accounts that have similar properties. By compiling a bid/miss list, what shops will often find is that there are common traits in jobs they didn't get. Perhaps their price was too high, perhaps they didn't have the right sales approach, and perhaps they don't have all the required capabilities. Shops should look for these common traits and try to understand the business opportunities they missed and what investments they could make to address those missed opportunities. 3. Selling more products to existing customers, an example of which would be if a shop invests in a new printer technology such as a flatbed or a dye-sub printer. They are now able to create a wider range of wide-format digital print applications than previous. Advancements in wide-format digital printing technologies are even allowing a wider range of substrates to be used in certain types of devices. A great example of this is seen in the use of LED curing which produces less heat and therefore allows a wide range of substrates to be used on LED-curing, wide-format flatbed printers. At their press conference during the 2013 SGIA Expo, EFI reported significantly higher print volumes on their LED curing production UV-curable inkjet systems than it has seen on their older mercury curing systems. The company attributed this to the ability to print a wide range of materials. However, simply adding the capability to produce a wide range of applications doesn't guarantee sales. Companies should identify what they are going to make, which of their existing customers they are going to sell these new products to, then how they are going to sell them. I think the selling approach is often the undervalued element of diversification. Companies planning to diversify their services should build a sales training component or the addition of new sales employees into their diversification plans. At InfoTrends we see this a lot wherein commercial printers think they will enter the wide-format digital printing business by simply investing in a new wide-format printer. What they often fail to consider is that the people to whom their salesforce is used to selling may be very separate from the people at the same organizations that are involved in the procurement of wide-format signage and graphics. The people that negotiate which company prints the Sunday newspaper inserts are usually very different than the people at those organizations that plan retail store spaces, and merchandising managers that influence signage and graphics, as well as store décor decisions. 4. 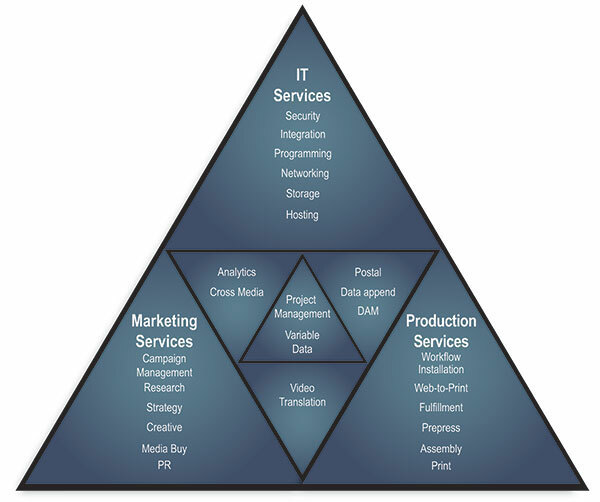 Selling new services to existing customers; an example would be where a printing company starts offering creative design, campaign management or other service elements that clients value but have never been offered before (Figure 3). Early in 2013, I got to visit, and tour a large commercial printer's facility. This print company reported, at that time, that they have added multiple IT resources, to augment the company's marketing capabilities for some of their bigger consumer packaged goods clients. This company had also added a wide range of security and compliance capabilities to offer those services to their pharmaceutical clients. They had also recently added a whole new digital book and print fulfillment capability to meet the needs of some of their publishing clients. These are all changes the company made in the past 18 months, because they looked at their printing business and recognized that these services would separate them from their competitors, and offer significant savings either in overhead or in supply-chain to their customers. What they are finding is that some of their other customers also take advantage of these new services once they are in place. As a side benefit, they are seeing that the advantages they provide to their customers through these new services are driving their customers' competitors to contact them to see how they can contribute to their success. In the wide-format printing business, InfoTrends believes that collection, analysis and application of data about signage and graphics will be another important development in the coming years. There are a set of disparate tools in existence now, systems that track the number of people that pass by a sign location, whether or not they viewed a sign, and the demographics of the viewer. Consider how these tools could be combined with a technology like Google Glass, so that the imagery and messaging on individual sign locations could be tailored to the individual viewer as they pass by. This is not as far away as it sounds; there is a company called RetailNext that has developed a way to use shoppers' mobile phone signals to track their path around a store to better understand shopping patterns. Retailers such as Nordstrom's, Family Dollar and others have tested these systems with the goal of creating the same kind of dynamic that shoppers get when shopping on Amazon.com. InfoTrends believes that, increasingly, these are the types of data-driven services that wide-format print buyers want their suppliers to offer to them, to help them optimize their marketing expenditures. A final word about diversification: Many commercial printers are increasingly entering the wide-format market seeking higher margins. InfoTrends expects to see more mergers and/or acquisitions of wide-format printing establishments by commercial printers who recognize that acquisition is the easiest way to enter the $16 billion wide-format digital graphics business. In a survey called Widthwise that InfoTrends works on with Image Reports magazine in the UK, over 20 percent of the shops surveyed had either been involved in a merger or acquisition, and about 30 percent reported that they would be interested in a merger/acquisition if they were approached. In turn, wide-format PSPs are entering new markets such as digital signage, 3D printing, advertising specialties, soft signage, T-shirt printing and garment printing - all multi-billion dollar markets that require specialized product and market knowledge. Lastly, the old adage is that "if you always do what you have always done, you will always get what you have always gotten." But this adage is outdated; the wide format business in particular is becoming more competitive, so there is a major risk in not adding to the types of printing and print-related services that wide format shops offer. Tim Greene is the director of InfoTrends' Wide Format Printing Consulting Service. As director, Greene develops InfoTrends' annual wide format digital printing market forecasts and conducts multiple primary research studies annually on these markets. He is often published in industry leading wide format publications, and has presented market trends and analyses at client sites and major industry events around the world. This article appeared in the SGIA Journal, January / February 2014 Issue and is reprinted with permission. Copyright 2014 Specialty Graphic Imaging Association (www.sgia.org). All Rights Reserved.